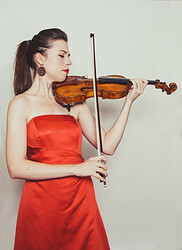 Multiple award-winning violinist Tessa Lark, a rising star in the classical realm and an acclaimed fiddler, notches several new career milestones this season and next, with a recital debut on Lincoln Center’s Great Performers series, a four-concert engagement with Australia’s Musica Viva Festival, concerto debuts with the Seattle and Indianapolis symphonies, and performances with the prestigious Seattle Chamber Music Society. At Musica Viva, in Sydney, her chamber music collaborations will be highlighted by a performance with bassist and composer Edgar Meyer in his Concert Duo for Violin and Double Bass on April 28. 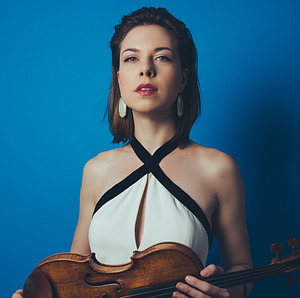 The following month, as part of the Seattle Symphony’s Brahms Festival, she makes her debut with that orchestra in a May 10 performance of the Double Concerto in A Minor, in partnership with cellist Jay Campbell. Tessa makes her Indianapolis Symphony Orchestra debut July 3-6 under guest conductor Alfred Savia—an engagement that includes three “Star-Spangled Symphony” concerts as part of the ISO’s Kroger Symphony on the Prairie festival. She returns to Seattle in mid-July for a series of performances with the Seattle Chamber Music Society, where her distinguished collaborators will include Cynthia Phelps, principal violist in the New York Philharmonic; Erin Keefe, concertmaster of the Minnesota Orchestra; and Raphael Bell, principal cellist in Belgium’s Antwerp Symphony Orchestra. And looking to next season, Tessa debuts on the Great Performers series at Lincoln Center in partnership with pianist Andrew Armstrong. Schedule for May 10, 2020, the recital features Ravel’s Tzigane along with works by Ysaӱe, Bartók, and Grieg.